I often get asked, "what kind of parrot should I buy for my children" or, "is a parakeet a good bird to get for my 10 year old child?" I do not really like getting asked this question because I know the answer I will give is bound to disappoint the questioner. The simple fact is, I do not believe a parrot is a suitable pet for young children. The good news is that I've discovered a fantastic solution. So this article will be presented in two parts. First, why parrots do not make suitable pets for children and then about a fantastic alternative. Parrots and parakeets are complex social birds. They require daily interaction and extensive care. They are not domesticated and do bite. Even hand fed parrots end up reverting to their wild state if not properly tamed, socialized, and continued for its entire lifespan. Speaking of life span, parrots live for a very long time. Budgerigars can live up to 20 years; many of the other parrot species may live 30-50 and possibly more. Children's interests change rapidly as they are growing up and it is often difficult to look a few years ahead, let alone 20. Parents often won't take into consideration the lengthy lifespan of a parrot when impulse shopping at a pet store. For any child between 5-15 years old, it is quite likely that even the shortest lived parakeets will still be around by the time they are off to college. Most campuses do not allow pets and a busy college student is hardly in position to take care of a pet anyway. Buying a parrot for the short term with the idea of setting it free or giving it away in time is not a solution. They cannot survive in the wild if captive raised because they lack the skills to survive and often the climate is unsuitable. Rehoming a parrot on the other hand is likely to cause it major trauma and separation anxiety. They have major difficulty adapting to a new home. Owning a parrot requires daily care and attention. 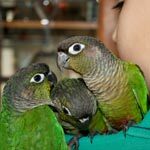 While a very young child may have enough time to do all the daily parrot chores (cleaning cage, washing bowls, providing clean food/water, changing toys/perches), as the child grows older may become busier and unable to care for the bird. High school and college preparation are very time consuming, forget even teenage activities. Since the bird lives inside a cage, it entirely depends on its caretakers to clean and provide for it. It cannot for one day be neglected. It needs to have fresh food and water provided daily. 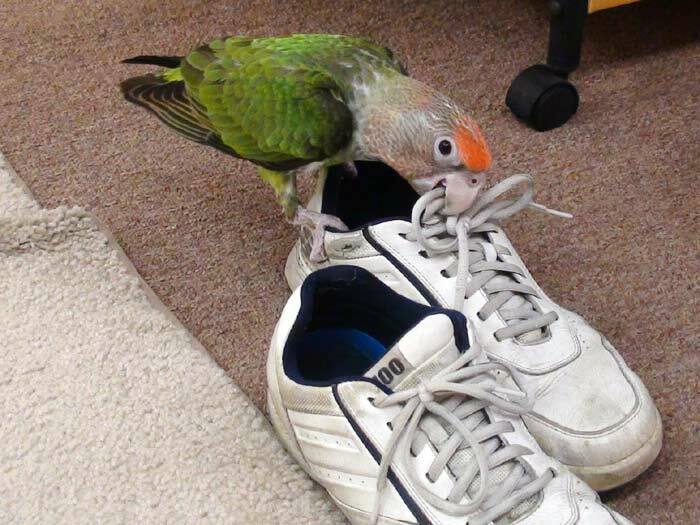 Cape Parrot chewing my shoe! Then there are things that only the parent can take care of. The parrot may need occasional vet checks and grooming (trimming nails and possibly wings). Supplies go fairly quickly as parrots are very destructive. New food, toys, and perches need to be purchased regularly. This can get expensive pretty quickly. While a budgie costing a mere $20 may sound appealing, the store is not dumb. They will sell the bird at cost or even a loss because over a hundred dollars in supplies is necessary. Under the most meager estimates, it will cost $100 in supplies for a $20 bird. More realistically it should run $200-$400 in the first year and at least $100 a year thereafter for its entire lifespan. So we're no longer looking at $20 for a cheap little pet. $100 a year for 20 years is $2,000. Let's not forget the $20 for the bird there, so you're looking at $2,020 and up across the lifespan to own a budgerigar. Other parrots are even more costly. $100 a year is the most conservative of estimates as a bag of food for a few months will run $10-$20, toys typically cost $10 each. With a $100 a year budget that is only enough to treat the bird to the most meager of living. Any owner that is more involved will likely be spending a lot more than that. Parrots are quite difficult pets to own. They are not domesticated and have a lot of personality. Being terrestrial mammals ourselves, birds are quite unfamiliar to us. 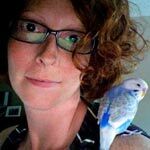 While it may be a bit more intuitive how to hold or pet a dog, we require much greater knowledge about how to take care of a bird. Parrots require taming and training to maintain handle ability. It is very important not to encourage biting by doing whatever the parrot wants (typically to be left alone) in response to biting. It is difficult for a child to resist a bite and even more so not to be scared in the future. It is actually very likely that after getting bit by the parrot a few times, the child will no longer want to have anything to do with it. 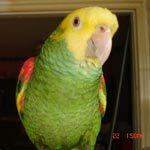 In order to understand the basics of handling a parrot, reading some books and online websites is highly advised. I advise parents only to acquire a parrot if they want one as a pet for themselves. They can allow the child to learn about responsibility and caring for a pet but only under parent supervision. If the child gets older, moves out, or loses interest, it would simply remain the parents' bird. Now I've learned a fantastic alternative to buying an actual parrot for children that are interested in one. 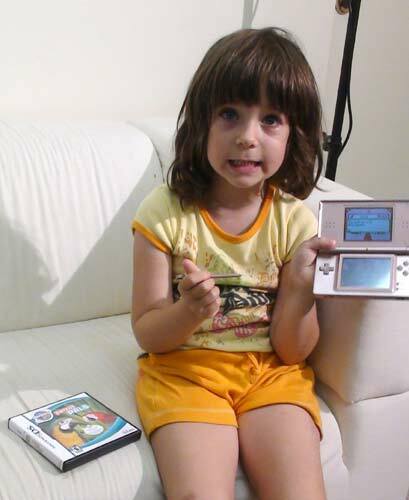 My little sister has been obsessed with Nintendo DS since she got one for her birthday. Recently I had learned that she was playing a parrot game on it called Parrot Pals. She came over to tell me what the game is all about. I apologize in advance if I make any technical mistakes as I have not actually played the game myself but am just going by what a six year old told me. So apparently the player gets to choose from an African Grey, Lovebird, Budgie, Sun Conure, or Cockatiel as their pet and then has to monitor the bird's status. The player can choose which foods to feed and can even clean the cage. Of course none of this is difficult or time consuming as it is in reality. Also, the player can speak into a built in microphone to teach the parrot to talk. There are many reasons why I think this game is better for children than a real live parrot. First of all, I think it provides instant gratification. If you push a button to feed the parrot, the parrot goes and eats. Everything happens in the now. Whereas a real parrot has distinctive free will and cannot be forced to eat, talk, or play on demand as the ones in the game can be. The game can be played on demand but also be abandoned at will. There is no long term commitment and a living animal does not have to face the consequences of a poor decision or neglect. A little effort goes a long ways in the game and can bring happiness to the child with instant feedback. Real parrot training can take weeks or months before any results are visible. A Nintendo DS runs a little over $100 but can be reused for multiple games. The Parrot Pals game seems to retail for around $20. This is still less than the cost of purchasing the cheapest available parakeets (budgies) and bears no long term costs (besides buying additional games, haha). 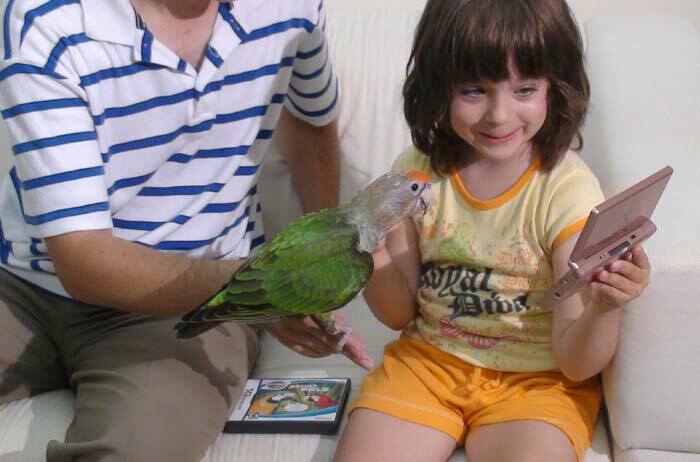 It's great to give the child a taste of what parrot ownership is about and then when he or she is independent, can make the choice of buying a parrot for him or herself. Another great alternative is the Webkinz series of stuff animal toys. They come in all different kinds and there are several parrot ones available. They usually cost under $20 and come with a code so that the child can play with them on the internet. These are fantastic for anyone on a tight budget but not as realistic as the Nintendo parrot game. In conclusion, I believe being brought up around parrots is a fantastic experience for children but only as long as there is a primary adult care taker responsible for the bird. Buying a parrot with the intention of a child taking full responsibility is risky and may be impossible in the long term. 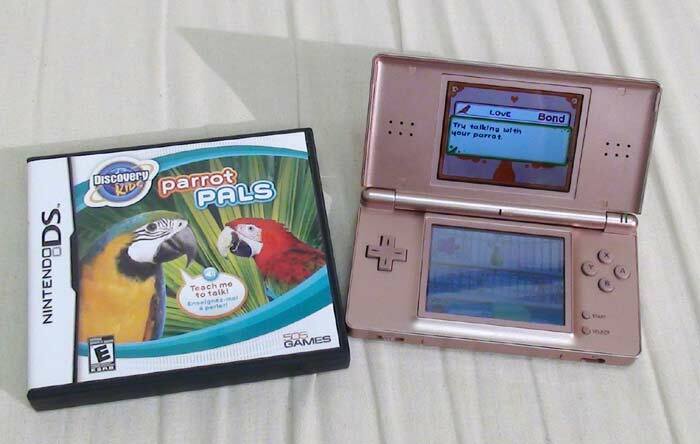 The Parrot Pals game made for Nintendo DS is a great way to give children the thrill and experience of owning a parrot without purchasing a live animal. So if you are wondering whether to buy a parrot for a child or are yourself a parrot owner and get asked this question, the line of virtual games has come such a long way that this is the best recommendation to make. That is too funny Michael ! You made your sister laugh so hard ! Great idea! I really appreciate your article and your video is great. I'm going to show it to my sister who is thinking of getting birds for my niece and nephew. Thank your sister for us for showing us the game! : ) I came across another alternative the other day: The VERY Best Parrot for Children�. 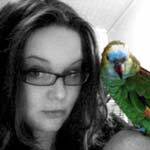 Squawkers McCaw [attachment=0:2ynsc2d3]41oI9zAgJXL._SS400_.jpg[/attachment:2ynsc2d3] Squawkers meets every (unreasonable) requirement for best parrot I�ve ever been asked about: - He�s NOT LOUD and won�t aggravate you or the neighbors - But he is GUARANTEED TO TALK up a storm - He doesn�t poop all over the place or make a mess - He NEVER BITES - He doesn�t demand attention and doesn�t need a large cage - He won�t go through a hormonal phase - He�s CUDDLY, even more so than a cockatoo - No vet bills, no expensive food, no toys = cheapest parrot ever! And when your children get bored with Squawkers, they can ignore him without any consequence. Oh that is great that they have a bird game now too! We have the nintendogs game and my 7yo loves to try and train them. Last night he asked me if we could get a bird to replace Ranger, our common parakeet who passed away end of last year. We had a lengthy discussion on why we can't just replace him. His Oma has parakeets and he can visit them all he wants. He really just misses him, we all do. He has one of those toy parrots, they are more annoying than a real one lol! But he enjoys it. I wouldn't be opposed to him having a bird, but I know I would do most of the work. He has grown up around birds and has always helped with their care. I'm sure he could actually tend to the bird completely, minus the money making and vet stuff. I grew up around birds and starting at 5 I always had a pet of my own. I mostly cared for it all myself, but my mom always made sure things were done properly. I'm not against children having birds, if it is done properly. I definitely think the majority of kids are better of with something fake though. hehe that is a REALLY good article and video!! Totally agree. Parrots are not even for all adults much less kids with all that it entails. You are never getting a parrot or any animal for the kid. It will be yours to take care of and maybe the kid will stay interested in said pet for a little while before getting bored and moving on to the next new thing. Great video and very cute. The most suitable parrot for a child is a real one end of story. My son is 11 and 100% committed to our birds. The only people that will disagree with my statement are those that have no children, or ones that can't be bothered teaching them. It really depends on the children... Sure most of them will find something new as they grow up but that does not mean all of them. My cousin in 10 this year and she has had a tiel for 2 years now and still going strong. She loves it and takes the most care with it... It is hard to say if it will continue for the next 5 years but I hope it will. Bmsweb - I think anyone that has seen your videos will agree that your sons are 100% committed to your birds. My parents let me have a cockatiel when I was very young... about 7 or 8 I think. She was wonderful and I loved her a lot and took care of her. I think cockatiels are great starter birds for anyone, including kids. It's important for the parents to be on board too though--my mother was great and helped me take care of Gadget by supervising the care-taking and making sure I was doing everything right. I was a gentle child, but I would also add that it's important for kids to realize that birds are fragile and independent-minded creatures. Gadget was a great little friend and I miss her. My parents bought me my first pair of budgies when I was 10 years old. For the most part I took care of them on my own. Now with my five birds mom and I share the responsibilities since I work long hours and she stays at home, and she absolutely loves to interact with them. Ever since we got the first pair of birds we both decided that we'll have birds for the rest of our lives. They are a joy to both of us. To her they are her grandchildren since she doesn't have any human ones yet. I am ten years old, and I am completely devoted to my Caique! I pay for toys, new perches, etc. I earn that money! I teach him tricks he is fully flighted, children can be responsible owners! My Caique is my third bird. I have budgies as well! I agree though, I am home schooled, so I have lots of time to care for my birds. Make sure your kid is doing their research before you get a parrot for them! Did u happen to notice if they had one of them DS programs for a "sim wife"? lol well anyways i agree with the small child bird thing my son is ten yrs old and he is very interested in our new flock.... squirrel opps there he goes. So anyways if you think or want a pet bird or a pet anything for child of any age make sure its a family pet because in most cases thats what it will end up being because any aged child to young adult have the attention span of a fruit fly. This is an interesting article! I really like the points put across, but I think this is a very generalised point of view. For example, in my case- I am currently fifteen, and planning on getting a single lovebird in August. However, before anybody reading this makes a snap judgement, I would like to say the conditions I am getting this bird on. I have wanted a bird for approximately three years, but never thought it possible until a friend got a budgie around september time last year. This sparked my interest again, and I asked my Mum if I could get a bird. She told me to do research, and after extensive (and I mean very, VERY extensive!) research, I concluded that a lovebird was the best bird for me. They're little balls of energy, and i really liked that about them. Also, I liked how cuddly they got with enough taming, and their cute little attitudes. I asked again, explained my research, and she agreed- Under one condition. I have to get straight A's in the GCSE's I am taking this year. My average is around that, and with enough revision I thought I could do it. I'm currently in the process of taking the exams, and am also doing at least three hours a day revision at the bare minimum! I have also calculated the cost of everything. I'm the kind of person who likes to be organised and prepared, so I have made a spreadsheet including every little expense this bird will need in advance- Travel cage, cage, toys, bowls, food, perches, climbing frames, a swing, treats, foot toys, even the delivery costs! I have been saving up, and can afford the �108.83 ($170.40) it will cost me (At the bare minimum- I'll probably fall prey to an exciting toy or two at the pet shop!) I have done research into the cheapest website, so I can spoil the bird with as many toys as I can afford! Note that this does not include the price of the bird and vet bills, my parents have agreed to pay for those. I think the thing people are most worried about here is the responsibility aspect though. I have that covered too. I'm already taking to spraying deodorant and body sprays outside, and closing the doors and opening all windows when my parents are using teflon pans- we only own two, and hardly ever use them, but I doubt I'll be able to get my parents to give them up. Luckily my bedroom is about as far away from the kitchen as you can get, and my door is always closed so that my dog and cat can't get in. I'll take every precaution I can with those pans. I don't like it, but I'll have to make do! 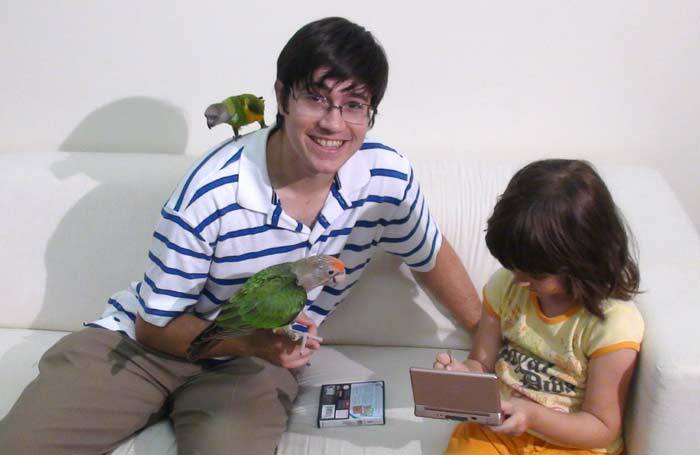 Also, I spend a lot of time at home, and will spend time with the bird for definite- I think over-bonding will be more of a problem than neglect in my case! I've also already planned for university. Also, the fact that i'll do a full cage clean once a week, wipe down the grate and toys twice a week and clean out the tray and food bowls daily goes without saying. So, in conclusion to this ridiculously long rant, I do think that birds are suitable for teenagers (Not children, I agree with that) but only If they've researched and planned for AT LEAST a year prior, and are responsible and mature for their age, and know what they'll be giving up- I know I'll have to get up a half-hour earlier in the morning to feed and clean, and go to bed earlier too, to give the bird enough sleep. I know I'll have less free time, and money for myself. I know that the bird'll be loud and sometimes annoying, and I know that I'll get bitten occasionally, and probably get a couple scars on my hands. And, in all honesty, I would willingly give it up two times over. you missed a few things. how much out of cage time? is the bird going to be shut up in your room all day? birds get bored very easily mine use 2-5 rooms in my house depending on their mood they like to look out all the windows and visit different people in the house.i have a playstand in one room,a tree in another,and branches attached to other walls in the house so there is always a place to land wherever they want to go.they need to be socialized with different people,someday you may have a relationship with another person and kids you don't want a one person bird that will attack anyone who gets too close to you. I know of an even better alternative: a dog. [quote="Arshia":3k9vplxt]I know of an even better alternative: a dog. [/quote:3k9vplxt] Why on earth a dog? They are just as much responsibility as a bird just shorter lived. They suffer from just as many behavioural problems, the long coat breeds need clipping reguarly or hours spent on grooming. They too need training, regular feeds, lots of walking (the minimum is not long or often enough for most breeds), playing with, entertainment, loads of money for upkeep, toys which need replacing when damaged, someone to look after them if the owner can't. Basicly what I'm trying to say is if you look after a dog correctly (provide more than the minimum requirements)then they require just as much time as a parrot. I cannot stand owners who get a dog and just let it out in the garden and walk it once a week if it's lucky. Even once a day is not enough for most dogs. Worse than that is a dog tied in the back yard. Even worse is a dog in a dog lot. My daughter has two boxers. We have five little house dogs that get stepped on if they get in the way of the boxers. She has put them in a dog lot. If I can't stand to lock a bird in a cage you know I can't tolerate a caged dog. I have created a morning and evening routine that alows me to close the little dogs in and let the boxers (titans) run for an hour each time. When they get tired (and they know how long an hour is) them come to the back deck and let me know they are ready to go back and be fed. Getting back to the Lovie conversation. They are full of energy and they also have attitudes. Tweetle Dee & Tweetle Dumb are the only creatures in the house that scare the Amazons.